Art history is a living thing that whispers to contemporary artists. For me as a painter it's a wind that fills my sails, but I get to set the course. In the top row the photo at the left is one I took of the studio bathed in morning sunlight when I stayed there in 2016. Hopper designed his painting studio down to the last nail. It was purposely built at the crest of a sand dune to allow unobstructed views in all directions. According to his wife Jo's journals, while she loved gazing out at Cape Cod Bay to the West, Hopper preferred looking inland over the then sparse rolling dunes. My Honeymoon Painting (36 Years Late). This painting was a long time in coming. Alice, my soon-to-be wife wanted to honeymoon in Acadia National Park. I’d always been curious so I said “sure.” We got married at the beginning of May 1983 and flew up to Acadia. 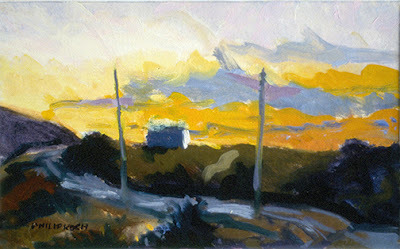 One morning I let Alice sleep in, and with the first light, crept out to go painting. Driving to a disappointingly fog-covered summit of Cadillac Mountain I thought “Let me wait a bit to see if the view will clear.” As if the weather gods were listening within minutes I was treated to the spectacle of the rising sun breaking through the fog. Like the clouds I was blown away. The Dawn of course, like a honeymoon, is a perfect symbol of new beginnings. I thought someday I must make a painting about this moment. This painting is going to be included in a curated exhibition Maine: The Painted State at Greenhut Galleries in Portland, ME April 4 - 27, 2019. This morning I was sorting through files of my early paintings and came across this one. The temptation is always to run straight towards your goal. Sometimes that works, but often it leaves you wide of the mark, especially in art. This lesson hit me over the head when I was just starting out as a painter when I was a studio art major at Oberlin College. 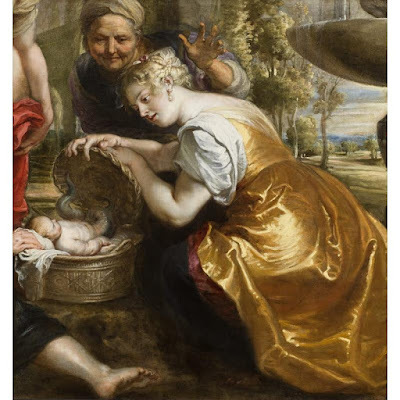 The school's Allen Memorial Art Museum has the most remarkable and troubling painting by the 17th century artist Rubens, The Finding of Erichthonius from 1632. Despite it having been mysteriously cut down in size years later it's still a powerhouse of a painting. Sometimes art museums can make all the difference. That happened to me in the summer of 1971. I was ending the first year of my MFA Painting program at Indiana University. By making lots of paintings I was growing as an artist. I also felt drawn to the University's art museum (now called the Eskenazi Museum of Art) and spent considerable time studying its Permanent Collection. There were two paintings in particular that jolted me into seeing and thinking about painting differently. Both were seemingly quiet landscapes by Hudson River School painters that had only just entered the Museum's collection. 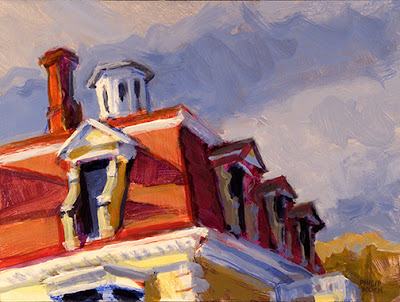 Philip Koch, Penniman House, oil, 9 x 12 inches, 2018, Addison Art Gallery, Orleans, MA Edward Hopper made one of his best known landscapes from a house and barn right on Route 6 in Eastham, only a stone's throw from the historic Penniman House in the Fort Hill area. While I painted this on a cloudy day, I remembered the angle of the sunlight in Hopper's painting Haskell's House seen below. 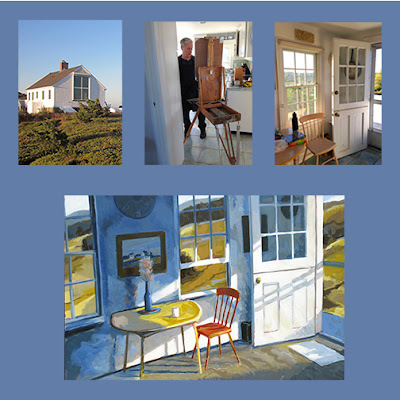 Addison Art Gallery in Orleans, MA has organized a whole number of exhibitions and events around the legacy the painter Edward Hopper left for contemporary artists on Cape Cod. 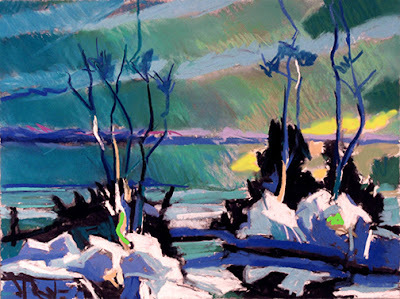 Helen Addison, the Gallery's owner, is spotlighting the deep connection Hopper had with the unique landscape of the Cape. Much of how we see this unusual place is guided by the dozens of paintings he made there. 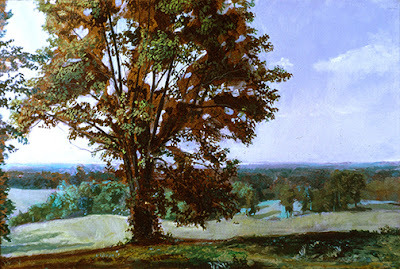 I needed to show someone some of the preparatory work I did for my large painting Chestnut Ridge Panorama below. It was the culmination of a 3 year long exploration. Above is a pastel drawing I made in the later stages to help me figure out what color chords to use in the painting's expanse of sky.